Week 10 of the NFL started off with a couple of high performing offensive linemen from the NFL Regional Combine platform at protecting their quarterback to dominant defensive efforts, capped with a dramatic Monday night ending. The Carolina Panthers came to Pittsburgh to face the Steelers Thursday night. Panthers guard Greg Van Roten is providing some of the best protection for quarterback Cam Newton this season. According to Pro Football Focus, Van Roten is an above average lineman. Unfortunately, the Steelers’ front seven got the best of him and his blocking crew. Due to an early turnover that resulted in a score, the Steelers were in complete attack mode and the Panthers’ front line was on its heels. “We had a really good first drive, and after that, we were kind of on our heels,” admitted Van Roten, according to Panthers.com. “They kept bringing the pressure and we had a hard time keeping Cam clean tonight. “It felt like they were bringing at least five or six (rushers). On the other side of the ball, the Steelers were solid in their protection, led by Pro Bowl tackle Alejandro Villanueva. 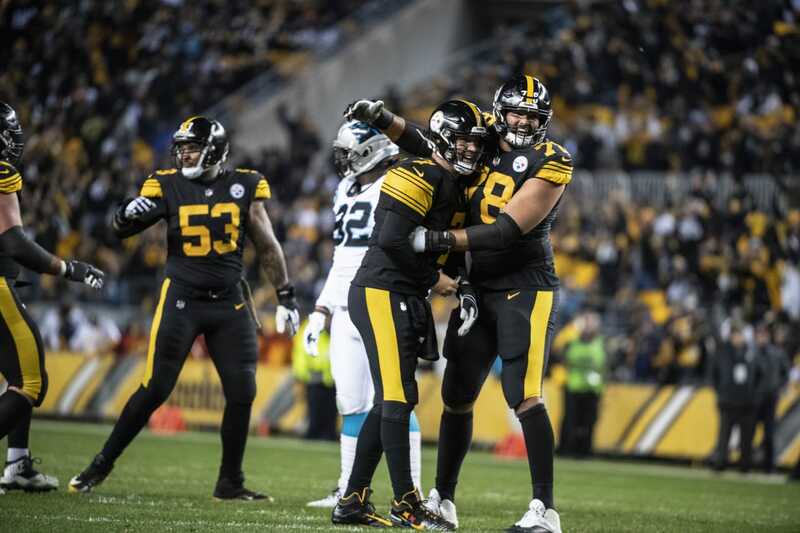 Other than Panthers veteran defensive end Julius Peppers getting a sack, the Steelers offensive line kept quarterback Ben Roethlisberger clean for 328 passing yards and five touchdowns. Surely, Van Roten and the Panthers will bounce back, while the Steelers look to continue their winning streak. The Los Angeles Chargers are fortunate to be deep in the linebacker position, and well-off that linebacker Jatavis Brown is on fire. With injuries to Joey Bosa and, now, Denzel Perryman who is lost for the season due to an LCL injury, the Chargers will need Brown to be the Brown of his rookie season in 2016 when he led the Chargers in tackles. Brown led the Chargers in tackles against the Oakland Raiders with 11 tackles. Brown was graded 89.9 by Pro Football Focus for Week 10, earning a spot of the defensive team for the week. Brown is currently third on the Chargers in tackles. If he keeps this pace, the RC pioneer may finish at the top again, and the Chargers will need that. Chargers cornerback Jeff Richards was promoted to the active roster in Week 10. San Francisco 49ers quarterback Nick Mullens was a surprise to many, but not to those who pay attention to talent. Mullens and the 49ers crushed the Raiders in Week Nine. For Week 10, the football world wanted to witness Mullens in action again to see either one of the two things – a duplicated output or failure (which was probably the majority). Clearly, the 49ers were encouraged by Mullens’ second prime time performance. The New York Giants picked Mullens off twice, off two deflected passes from 49ers receivers. Still, despite some costly penalties by the 49ers’ defense with under two-minutes left in the game, which led to the Giants taking the lead, Mullens put the 49ers in position to win with no time on the clock from the Giants’ 20-yard line after driving nearly the length of the field. Mullens was calm and threw on the dime passes. Mullens, however, sailed the ball too high in the endzone and the Giants escaped with a win. The 49ers are pleased with Mullens’ leadership, and chances are, he will get a crack at the Tampa Bay Buccaneers in Week 12 on the road after the bye. Giants fullback Elijhaa Penny caught two passes for 12 yards. -Indianapolis Colts cornerback Kenny Moore II continues to lead by example as he drilled the Jacksonville Jaguars’ ball carriers for six tackles, causing a fumble. -Atlanta Falcons wide receiver Marvin Hall snagged a pass for 12 yards. -Arizona Cardinals defensive end Benson Mayowa did all he could to stop the high powered Kansas City Chiefs. He finished with two tackles, both were for losses and one was a sack. -Los Angeles Rams kicker Greg Zuerlein was perfect as he went three-for-three in his field goal attempts in the highly contested matchup against the Seattle Seahawks.